* This review may contain spoilers for the previous books in the series. To Sum It Up: With the shadow king Osaron on the verge of taking control of Red London and all of its people, Kell, Lila, Rhy, and Alucard race to discover a way to stop him. They find themselves bargaining with shady figures, making unlikely allies, and sacrificing whatever is necessary in order to stand even the smallest chance against Osaron. As unstoppable as the shadow king seems, though, his weakness may be underestimating the determination of those fighting to save Arnes. Review: I may have set a personal record for longest amount of time taken to read a book while reading A Conjuring of Light. It took me about five months from start to finish. This had absolutely nothing to do with the book itself and everything to do with my mindset due to all the goings on outside the world of books. 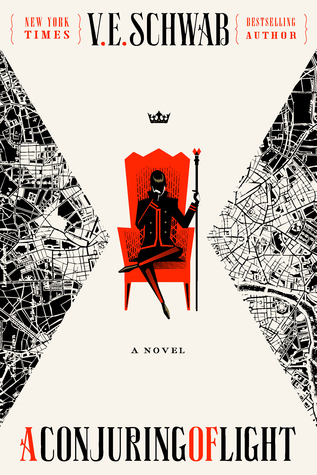 Finally, though, I found myself with some time to get reacquainted with this novel, and once I dove back into its fantastic world of magic, multiple Londons, and a many-sided coat, I devoured the remaining pages, reading more in two days than I had in almost two months. The previous book in the series, A Gathering of Shadows, ended on one hell of a cliffhanger, and mercifully, A Conjuring of Light dives right into seeing its resolution. Don’t be fooled into thinking, however, that the book is done giving you heart palpitations because it’s only just beginning. I felt rather wrecked by the time I was done reading A Conjuring of Light. 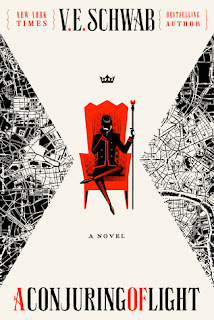 Even when there isn’t an action scene taking place, the threat posed by Osaron, the evil magic that’s taking over Red London, is always so palpable that you’re on edge for just about the entire book, waiting for the next stab to your heart, as sharp as one of Lila Bard’s knives or quips. Osaron seems such an unstoppable foe, and every clash with the shadow king and the unwilling followers he creates by invading their minds is a fierce battle. Not only do Kell, Lila, and Alucard need to contend with that in order to escape Red London in the hope of finding an object that may help them, but they also have to fight off vicious pirates and literally bargain with their lives. Sacrifice also looms large over the main characters, both the ones who wield magic and those who do not, as they’re all pushed to their physical and emotional limits—sometimes beyond. In addition to creating an incredibly immersive magical world, Victoria Schwab has exquisitely crafted complex characters. What I especially love about them is that they’re flawed. They make mistakes, and there are consequences, and that is what makes them so relatable. Schwab also possesses a knack for writing the best morally gray characters, like Victor Vale from Vicious and Holland from Shades of Magic. Holland has been an intriguing, complicated character from the outset of the series, and with the addition of some backstory in A Conjuring of Light, Schwab once again demonstrates just how gifted she is at creating characters with seemingly endless depth. I absolutely love badass thief/pirate Delilah Bard. No matter how hard or how many times this resilient lady gets knocked down, she gets back up and keeps fighting. I can’t emphasize enough how intense this book can be at times, usually with Lila right in the thick of the action. My list of favorite things about this book and this series could go on and on, so I’ll only mention one last highlight: the bond between Kell and Rhy. Of course, it goes way beyond just being brothers because of the magic Kell used to tie their lives together in order to save Rhy’s life. Here again, Schwab examines all of the facets of Kell’s actions back in A Darker Shade of Magic. Yes, Rhy is alive, but he continues to struggle with the weight of what happened to him as well as with the weight of his crown—a prince without magic whose people are under attack all around him. Rhy’s arc is as compelling as it is outstanding, and the same can be said for the arcs of Kell, Lila, Alucard, and Holland. As a series finale, A Conjuring of Light delivers in every way imaginable. It’s heart-pounding, sometimes even humorous thanks to the witty dialogue, occasionally heartbreaking, and most definitely magical. All in All: If you love books about magic, this series is not to be missed. A Conjuring of Light is an absolutely stellar close to Shades of Magic. Anoshe, indeed.